The advent of the digital computer made it necessary to reorganize the theory of structures into matrix form, and the first edition of this book was written for that purpose. It covered the analysis of all types of framed structures by the flexibility and stiffness methods, with emphasis on the latter approach. At that time, it was evident that the stiffness method was superior for digital computation, but for completeness both methods were extensively discussed. Now the flexibility method should play a less important role and be characterized as a supplementary approach instead of a complementary method. The flexibility method cannot be discarded altogether, however, because it is often necessary to obtain stiffness through flexibility techniques. There are several reasons why matrix analysis of structures is vital to the structural analyst. One of the most important is that it makes possible a comprehensive approach to the subject that is valid for structures of all types. A second reason is that it provides an efficient means of describing the various steps in the analysis, so that these steps can be more easily programmed for a digital computer. The use of matrices is natural when performing calculations with a computer, because they permit large groups of numbers to be manipulated in a simple and effective manner. The reader will find that the methods of analysis developed in this book are highly organized and that the same basic procedures can be followed in the analysis of all types of framed structures. In writing this book, the authors have assumed that ‘readers will be interested in preparing their own programs for structural analysis or will at least like to see how that is done. While the details of coding a program in a particular computer language are not covered completely, the emphasis is upon FORTRAN, which is the language most frequently used. Chapter 5 contains FORTRAN-oriented flow charts of programs for analyzing the six basic types of framed structures. These charts will help readers code their own programs should they desire to do so. The first chapter of this book covers the fundamental concepts of structural analysis that are needed for the remaining chapters. Those who have previously studied theory of structures will find that this material is mostly review. Anyone who is encountering structural theory for the first time, however, will find it necessary to become thoroughly familiar with these basic matters. The flexibility and stiffness methods are introduced in Chapters 2 and 3, respectively. In Chapter 4, the stiffness method is further developed in a computer-oriented manner in preparation for programming. Flow charts of computer programs for analyzing all types of framed structures are presented in Chapter 5. In order to maintain the earlier emphasis on fundamental matters, many special topics are postponed until Chapter 6, where such topics as nonprismatic members, temperature effects, and elastic connections are considered. All of these subjects can be viewed as modifications of the basic procedures described in earlier chapters. Problems for hand solution are given at the ends of the first four chapters, and these problems are generally placed in order of increasing difficulty. All examples and problems in Chapters 1, 2, and 3 (and the Appendixes) are in literal form, while the numerical examples and problems in Chapters 4 and 5 are in both US and SI units. References for further study, a list of notation, and appendixes containing tables of useful information are at the end of the book. Notable among the appendix topics are the unit-load method for calculating displacements (Appendix A) and computer routines for solving equations (Appendix D). Answers to all of the problems are also given at the end of the book. In this edition, several important topics have been added to make the book more up to date and complete. The following sections and appendixes are new: 1.13 Energy Concepts, 1.14 Virtual Work, 2.7 Formalization of the Flexibility Method, 3.6 Formalization of the Stiffness Method, 5.12 Combined Program for Framed Structures, 6.2 Rectangular Framing, 6.3 Symmetric Structures, 6.5 Automatic Dead Load Analysis, 6.10 Translation of Axes, 6.11 Member Stiffnesses and Fixed-End Actions from Flexibilities, 6.13 Curved Members, 6.17 Offset Connections, Appendix D: Computer Routines for Solving Equations, and Appendix E: Solution Without Rearrangement. 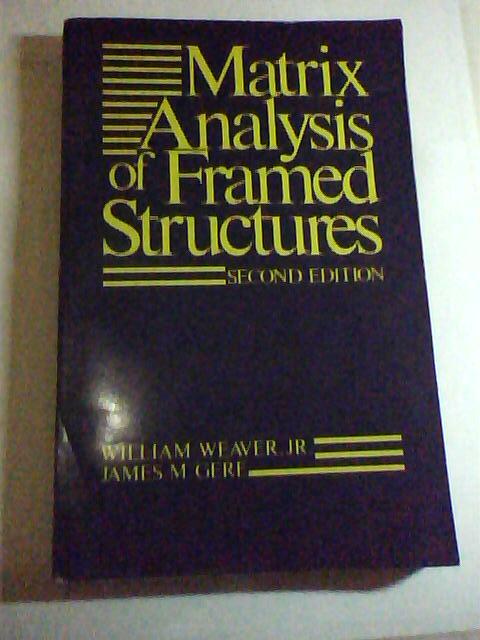 The word Matrix now appears in the title to clarify the fact that the book deals with the analysis of framed structures by matrix methods. The authors wish to express their appreciation to graduate students Paul R. Johnston and Moshe Eisenberger for doing an excellent job of coding and improving the programs. Thanks are also due Laura J. Selby for outstanding work in typing the manuscript. Finally, the authors are much indebted to Dr. Winfred O. Carter of Utah State University for his helpful advice during the preparation of this edition.